I was very impressed with the documentary, “Evolution vs. God”, produced by evangelist Ray Comfort. In this film Comfort interviews prominent evolutionary scientists from UCLA, USC and the University of Minnesota Morris, as well as students majoring in the sciences. He questions them about evolution, and asks some tough questions, and their responses become very thought provoking. The thing I really appreciated the most was the way Comfort led them through a thought process toward God and Jesus Christ. He built on their answers and steered them in a logical direction in which Christ and salvation was the logical outcome. 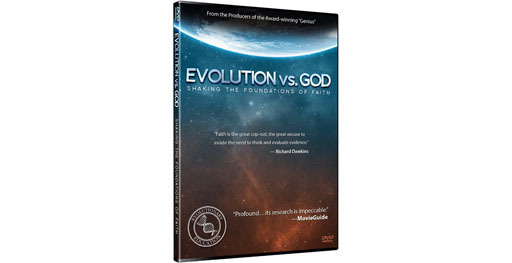 The film began with a quote from Richard Dawkins: “Faith is the great cop-out, the great excuse to evade the need to think and evaluate evidence.” Dawkins intended this quote to denigrate Christianity and religion, while giving evolution the illusion of reason and intelligence. But Comfort turns the tables on him and demonstrates how evolution is built upon faith. Those interviewed for the film admitted they were atheists and that there was no God. They came across as very certain that their reason for being an atheist was based on facts, evidence, science, logic, and that all scientists are in agreement over evolution. Comfort defined the scientific method from Science Daily, which is “the collection of data through observation and experimentation.” He then asked if anyone could provide him with observable evidence that evolution is true- something he wouldn’t have to receive by faith. He was very careful in his explanation of what he was looking for. He wanted observable evidence for Darwinian evolution or a change in kinds, not adaptation or speciation. But time and again the only examples provided were examples of speciation and adaptation. No examples of Darwinian evolution were provided. Evolutionists typically have a hard time answering these types of questions because they have a slippery definition and concept of what evolution is. The usual approach is to provide examples of speciation, adaptation and natural selection, identify them as examples of evolution, and then extrapolate that with the assumption that millions of years will produce new organisms with unique traits and functions. But even though they are unable to provide a single example of one organism evolving into another kind of organism, they believe that it’s a fact that evolution happens because we’ve been able to observe examples of speciation over the course of our lifetimes. But this is a bait-and-switch tactic. If the term evolution is properly defined, then examples of speciation, adaptation and natural selection should be excluded from the discussion. Otherwise it’s assumed that a change in the shape and size of a bird’s beak over time proves that an organism without feathers gave rise to birds with feathers (dinosaur to bird evolution). But this is unreasonable, and is a matter of faith because such a change has never been observed. There’s no reason to believe that the same process that determines superficial appearances in an organism, such as length and size, can create some unique trait that never existed in that organism’s ancestry, such as lungs from a lungless ancestor. We can’t assume lungs can evolve in an organism that never had lungs just because its ancestors varied in size, shape and color. Such assumptions are based on faith and not observational evidence. It was very telling to watch those being interviewed struggle to provide real, observable examples of evolution. Comfort asked PZ Myers, an Associate Professor of Biology at the University of Minnesota Morris for an example of observable evidence that evolution is true, something he wouldn’t have to receive by faith, and Myers immediately began, “Sixty five million years ago…” And Comfort quickly explained that he wasn’t alive 65 million years ago, so we wouldn’t be able to observe what happened sixty five million years ago and that we’d have to accept such claims by faith. Myer’s example wouldn’t suffice as observable evidence for evolution. Gail Kennedy, Associate Professor of Anthropology at UCLA, at one point admitted that evolution is not testable over time. I think she also had the best quote in the film, stating that “The problem with those who are unable to see evolution, I think it’s that they don’t have imaginations.” It’s humorous to think that one must have a good imagination in order to believe in evolution. But there’s some truth to that because evolutionists are very good at telling stories, hoping that if they’re clever enough, people will believe them. After a while the professors and students were forced to admit that they’d need some amount of faith to believe in evolution, and that they don’t believe there’s any proof yet. Some admitted that they haven’t seen any evidence, and others admitted that they put their faith in the experts, similar to having faith in God. Finally some admitted that evolution was a belief built upon blind faith. This really was an excellent film, and I’d encourage anyone to purchase a copy and watch it in its entirety. Ray Comfort and his ministry, Living Waters, is doing a fantastic job of evangelism and outreach through media productions such as this to impact people around the globe and spread the gospel of Jesus Christ. They’re even providing free DVD copies to university students across the world. If you want to be part of this, please consider purchasing a copy, or donating to their cause. A link to their website is below, where you can order your copy. Currently the cost of the DVD is only $5.00. If you’ve seen it, let me know what you think. I know that we’ve had this discussion before, but I can’t help but offer an alternative point of view. I think that there are a lot of misconceptions about evolution on the part of everyone, regardless of their faith and educational background. I know that I’ve made this argument before, but some of the people interviewed kind of hit the nail on the head. It’s incredibly hard to test something that takes tens or hundreds of thousands–even millions–of years to occur. That doesn’t mean that isn’t a possibility, or that it’s even unlikely, and in my opinion it doesn’t mean that we should ignore things like speciation and adaptation, two things many people take as evidence that evolution is correct. But I think that the biggest misconception about evolution out there is that because adaptation, mutation, and natural selection are continuous processes, evolution must also be one. With regard to witnessing the creation of something new–like a set of lungs where before there were none–I think we can go back to the mother of all inventions, so to speak: necessity. While things like mutation are random and spontaneous, evolution is not. That is to say, if an organism is suited for the environment for which it currently lives, why would it change? It doesn’t make sense for nature to select for traits that an individual does not need or that biologically do not make sense. From an evolutionary standpoint, the probability of me evolving gills is probably about as close to zero as you can get (I never like to deal in absolutes). That’s why the one professor from the video started his explanation with “65 million years ago…,” because the environmental has shifted substantially over those epochs–and it’s those changes that necessitated the evolution of something new, something only brought about by random mutation. That’s also why the probability of you or I “witnessing evolution” is quite low, unless human beings had a lifespan in the tens of thousands of years, of course. Which leads me to my next point. I’ve been giving the idea of “observation as evidence” a lot more thought. Comfort is quick to dismiss the professor since he was not around 65 million years ago. To me, this seems a weak argument at best. Neither you nor I saw Leonardo Da Vinci paint the Mona Lisa. There’s no video of him painting it. There’s nobody alive who may have witnessed it that we could interview. And yet, I’m more than willing to bet that if someone asked you “Who painted the Mona Lisa?” that you would of course answer Leonardo Da Vinci. Once again, I must stress that I do not believe that evolution and God are mutually exclusive. As far as I’m concerned, there’s no logical reason why the two couldn’t both be true. I happen to be an atheist who believes in evolution, but I am not an atheist *because* I believe in evolution. In other words, the tenants of evolution do not lead me to the belief that there is no God. Ryan, thanks for offering your point of view- it’s much appreciated. I wish I was good and being brief, but I’m really not. I think your comments deserve further discussion, and I want to understand your points, so let me dive in, and then feel free to clear up any misconceptions I may have. I completely understand your argument on how difficult it is to test something like evolution that takes thousands or millions of years. But I think that’s one of the points the film meant to draw attention to. You’re quite right that this criticism doesn’t mean, in and of itself, that evolution isn’t possible. The criticism is meant to shed light on a number of issues. It’s meant to shed light on the misconceptions of evolution- such as how it’s defined, whether or not it takes faith, whether or not it’s based the scientific method, and whether or not creation and intelligent design are worthwhile alternatives- rather than dismissing them based on who has the political power, might and bully pulpit to control the argument and legislation. The film was also meant to cause them to question what they’ve been taught, and call attention to their underlying belief systems, assumptions and overall worldview. I think the film was successful on these grounds. Okay, now even though evolution isn’t impossible based on the fact that we can’t observe it over incredibly long periods of time, that should be enough to promote healthy skepticism, and it should be reason enough to demand more stringent examination of the evidence, more careful explanations of the data, and an acceptance of criticism. If a hypothesis must be falsifiable, then scientists cannot reject criticism simply due to their political agenda to protect evolution, or cry “Separation of church and state!” Such tactics promote scientism rather than advance science. It seeks to avoid discussion and debate and causes greater harm than the alternative. Most of those interviewed in the film thought evolution was a fact because that’s what “the experts” and textbooks “told” them. They knew of only one possible conclusion, and only one way to examine the evidence, and they were never allowed to consider any contradictory evidence. Many of them even came across as hostile to the thought of questioning evolution, or that there could possibly be an alternative. Professor Gail Kennedy proclaimed, “We can teach ANYTHING we want!” But that’s a statement from ignorance because she’s obviously not aware of all the professors who were fired for doing so. If professors could freely teach ID or creationism in college, for example, without persecution, then I’d argue we’d make some tremendous progress in science and our society. But there’s tremendous opposition to that. The fact that it takes long ages to really falsify evolution based on your argument should be cause to consider why evolution is promoted as a fact, or if it’s even possible. If it’s impossible to falsify based on your premise, then why is it even considered a theory, let alone a hypothesis? Here’s my take: until it’s able to be falsified, perhaps it shouldn’t be taught in science class at all. Maybe it should be taught in History, Social Studies, or Religious Studies. Why should it be legitimized as “scientific” when it can’t be proven via the scientific method and must be believed by faith? Evolutionists often ask this of creationism, and I would only agree if both were treated equally. If evolution, ID or creationism were given equal treatment, then there would be freedom to teach them within the various courses, whether it’s science, history, religion, etc. This would be helpful as long as there wasn’t discrimination or persecution for anyone wishing to teach them, or for those wishing to present criticisms. Are we a society with freedom of speech and freedom of religion or not? I’m trying to follow your argument that evolution is based on necessity and isn’t random or spontaneous. Maybe you can help me out a little. I know science has gone in a complete circle on this. It was once believed that the giraffe’s neck became longer because it needed to reach the higher leaves in the trees, but then this Lamarckian idea was discredited, suggesting that evolution was completely random. Now it seems that the environment does contribute to changes within an organism. But I would once again argue that this is speciation, not evolution. It could only be called evolution if completely new or novel traits were instilled into an organism, or if a different kind of organism was correctly identified. If, for example, only cats existed, but not dogs, and if cats developed the ability to bark, or developed other traits that never existed in the cat-kind, then I may consider that an example of evolution, and at some point we’d call this new organism a “dog”. I’m not sure how we could test such a hypothesis, other than introducing different animals to a wide variety of environments that they’re not accustomed to, and see if they develop any new traits over 300 years or so- although we might not live that long to witness the results. But, on the other hand, humans have been around long enough to witness the effects of animals introduced to new environments- but they’re still the same organism and haven’t evolved into something else. For example, there are both land and aquatic iguanas on the Galopogos Islands, and we know they’re both related. However there are remarkable differences and variations allowing them to be well-suited to their environments. They’re different species, but they’re still the same kind- iguanas. They’ve adapted to their environments without adding anything new to their genome. They’ve utilized existing genes to adapt. So, instead of providing an example of evolution, this is another example of speciation, which supports the creationist account rather than evolution. I do like your argument that, if an organism is suited for its environment, why would it change? I’ve often used this argument to support creation. Why would dinosaurs, for example, change into birds? Evolutionists have had to invent clever stories to explain why this might happen, but dinosaurs were, at one time, well suited to their environment- which is why they thrived long enough to reach their enormous sizes (assuming evolution). Therefore it doesn’t make sense that they’d evolve wings and turn into birds. As you stated, it doesn’t make sense for nature to select for traits that an individual doesn’t need, or that biologically do not make sense. The probability of them evolving feathers is probably about as close to zero and us evolving gills. Okay, 65 million years later the environment endured tremendous changes, necessitating the evolution of something new. Say a meteor impact caused ash to cover the sky for 150 years (contrary to modern day impacts), would that be enough time to trigger feathers and a completely new lung system, bone system, and behaviors so that dinosaurs could become birds so that they could survive in the new environment? We’ve been studying organisms since before Darwin was born, but we have no such examples. Okay, now what happens once the natural disaster has run its course- why did other organisms, including ones that were light-sensitive, survive while the dinosaurs didn’t? Why couldn’t the dinosaurs have survived without evolving feathers and turning into birds? Does it really make sense? I’m just trying to demonstrate that evolution requires more faith than most are willing to admit, and that a far more simpler and logical answer is more likely. God created animals to reproduce after their kind, just as the Bible says. This could explain why we don’t see animals changing into other animals. Dogs have been around since ancient Egypt, yet, despite breeding and natural changes in the wild, they haven’t turned into anything other than different species and varieties of dogs, despite the extreme environments they’re found in all over the globe. To some degree I understand how the genome uses information already stored within it to help its descendants survive in their environment. In some cases it’s just random, and those that are better equipped to their environment survive, while those that aren’t will most likely die before they can reproduce. And in some cases the offspring will receive the correct set of genes necessary for competing in the new environment. But that’s all speciation at this point. At what point does “meaningful” new genetic information become present in the gene so that it can be selected naturally? When does an organism obtain the genetic information to build new features that were never available in previous generations? Let’s stick with our example of lungs from a lungless ancestor. We can concoct a scenario in which the environment is drastically changing, and the organism requires lungs in order to adapt. Okay, that will take nearly a million years before the new information can be entered into the genome in order for it to begin transforming the entire organism through some type of epoch long metamorphosis. Does the genetic information appear in the genome because the environment dictates it, or does it appear randomly? And if it appears randomly, how does it “know” how to create a code that will develop a complicated system like lungs that can interact throughout the entire organism, including its bone structure and blood system? Is it trial and error, or is it planned and intentional? The entire organism would have to be transformed from the bottom up, replacing unneeded systems with a new improved system. And if the organism could survive a million years while waiting for the new set of lungs to develop so that it could move into land and survive in a new, hospitable environment, then maybe it didn’t need to evolve at all. If the organism and its descendents could survive in a hostile environment for millions of years, then why waste the energy to develop new systems and go through an incredibly complicated transformation? At what point does evolution even make sense? Well, maybe the information coded within the genes is just looking for improvements to optimize the organism, but why would it expend so much energy? Don’t organisms try to conserve energy? Doesn’t the genome work to prevent and repair mutations? There’s so much that doesn’t make sense that, to me, God’s Word and the Genesis account makes so much more sense. If an organism is unable to survive in a new environment, it must either adapt quickly, or it goes extinct- it doesn’t evolve. And I believe that’s what happened to the dinosaurs. After the flood the new environment wasn’t conducive, so eventually they died off. I follow your Mona Lisa example, however I see some problems. At some point it boils down to having faith that Leonardo Da Vinci is the one who painted it. While you’re willing to bet that Leo is the painter in question, we can’t be 100% certain because that would mean that we need stronger evidence, like watching from a time machine, or perhaps having multiple sources confirming eye witness testimonies. Sure, we can say with confidence that Leo did it, but that doesn’t prove that he did it. And there may be little cause for doubt, so we have no problem accepting by faith that he did it and rightly give him credit. But it still requires a certain amount of faith. The argument gets murky when there are absolutely no eye witnesses and no documentation of an historical event- like dinosaurs evolving into birds. The Mona Lisa analogy is no longer useful because there’s no stamp on the fossils telling us who its ancestors are, its age, what stage of evolution it’s in, what current species it is, and what it’s trying to evolve into. All those things must be determined by a fallible human being based on certain experiences, education, worldview and faith. Whatever conclusions they reach can never be proven because they’re using educated guesses based on what they know and believe. Most of them aren’t reading the Bible and saying to themselves, hmmm, if Noah’s Flood occurred around 4,000 years ago, then that would explain why this organism is buried where it is. No, they’re excluding God entirely and assuming that natural processes are responsible for producing the geologic ages and the fossil record, and that such a record implies ancestry. This thought process may be perfectly reasonable to those who don’t believe in God, however, for those of us who trust God’s Word, the fossil record and geologic column supports a worldwide flood. We would expect all living organisms on earth (not on the ark) to perish and be buried by layers of sediment. I know there are many Christians who are theistic evolutionists, so in that sense evolution and God are not mutually exclusive. But I would argue that theistic evolutionists have many theological hurdles that must be addressed, and that it requires mental and spiritual gymnastics to harmonize the two. We can address those details in another discussion, but, at some point there amasses too many contradictions that that individual must either ignore the problems, trust that they’ll never be able to completely resolve them, or they’re going to end up rejecting one or the other. For example, are Adam and Eve real historical figures? If they’re not, then the Bible is wrong, and where does that leave Jesus, who is related to Adam according to the chronology in Luke 3:38. And if they are, and they evolved from other “protohumans”, then have any of the protohumans survived and are part of the human population, and do they have souls? There’s a lot to wrestle with if one is willing to accept both evolution and Jesus Christ.